Spring has sprung and things are moving faster now. The days are warmer, longer, and filled with more activity than we've seen in these parts for the past few months. Of course having a rambunctious pup around brings a lot of life to the Camano Homestead ("noise" is what Steve calls it) but on top of that we've been on a serious property search. Having exhausted the possibilities in the South Sound (or at least what is available on the real estate market at this time), we are turning our sites to the Port Townsend area. We recently took a trip to Port Hadlock to check out the marina, and dare I say, we both fell in love. The community is sweet, welcoming, dog loving, boat-centric and wonderfully down-home feeling. The area is rural without being redneck, and the proximity to Port Townsend, which is full of travelers, artists, eccentrics, and world-class boat builders, makes it a perfect area for our relocation. Now we just have to sell the Camano Homestead and find a place to land. Meanwhile, I have taken a part time job with Camano Sail and Power where I am job sharing with my good friend Bonnie for Captain Lawrence Baum. That's me in the Geek Cruises Sweatshirt--I know what you ex's are thinking! 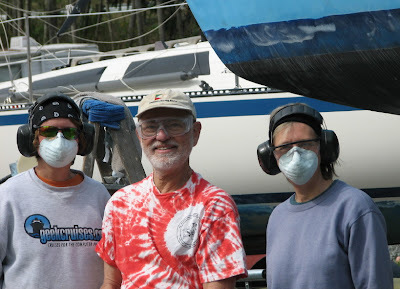 My work so far has consisted of sanding and preparing a J24 and a Hobie 33 for launch in May. I am happy to be gaining hands-on time working on these two swift little boats and can't wait for the day we finally splash them. 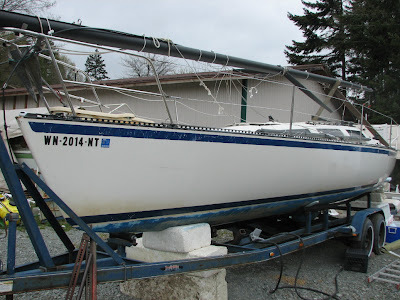 The Hobie will be in the water by May 9th. Come on down to the Cama State Park and get a free ride on the historic schooner Adventuress or even on Samurai, as we participate in the Annual Center for Wooden Boats' Mother's Day Saturday Sail at Cama Beach. Lil Samurai. J24 just before the final buff. 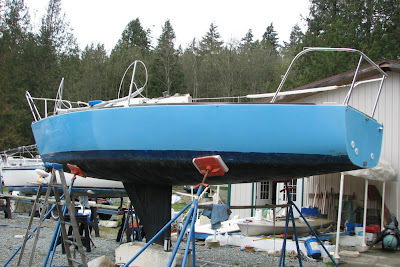 Hobie 33 with lift keel. 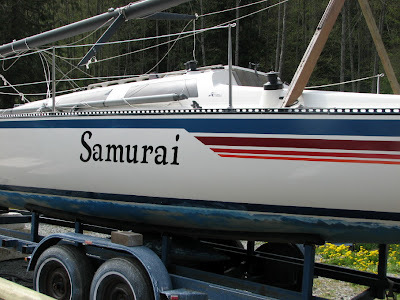 Samurai with freshly painted stripe and new vinyl lettering. Sharp! This job is perfect for me, because it requires no long-term commitment, offers new skills, and pays for the pup's vet, chow and bone bills. Sigh. If we move, no worries. If we stay a bit longer, Lawrence will make me an assistant sail instructor for his dinghy sailing classes, and crew for any charters. In addition, if I stick around long enough, I might even get my Keel Boat Skipper Certification as well. So no matter what the future dishes out, I am sure to be spending lots of time on the water this year. One of the most exciting things I've been taught is how to overhaul winches. This sounds scary, especially for a girly girl like me (yeah, right!) who doesn't usually do so well with things mechanical (the honest truth). 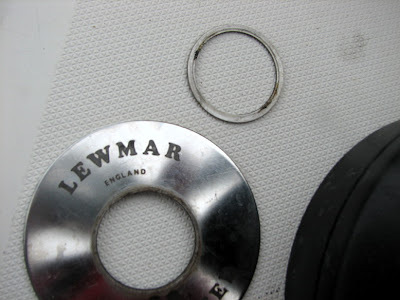 Yet, in the past few days, Bonnie and I have overhauled a couple Barient two speed winches, two single speed Barients and five Lewmars. I found it incredibly satisfying to see how these things work. 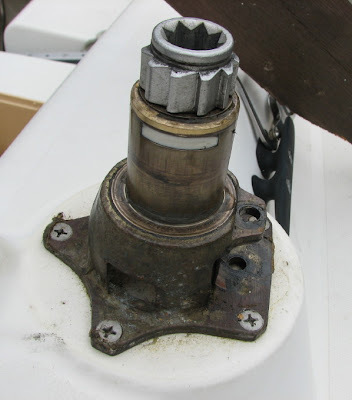 Winches, as every sailor knows, are one of the most crucial pieces of equipment on a sailboat. Plus, somebody's life could rely on the use of a winch to pull an overboard sailor onto deck or to hoist a crew member up the mast. So learning how they work, how to disassemble, clean, grease (minimally please!) and reassemble them feels like a great skill to have under my belt. Sensing the difference between a grimy, sluggish, or over greased winch and a clean, smooth running winch, feels really good. Now, for my readers who are sailors, bear with me as I explain the process. Or just skip to the end. Many of my readers know me from my other lives as a writer, theatre artist, or librarian (with a small "L") and know very little about sailing. Here we go. 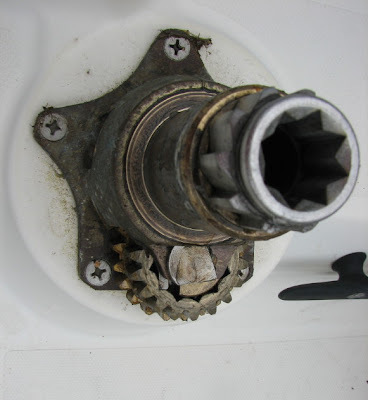 To take most winches apart one needs only a strong fingernail, or perhaps a screwdriver if you don't want to "break a nail." Make sure you have a can or box or something to put all the parts into as you take them off; you don't want something rolling overboard for God's sake! First you remove the circlip, a little ring that coils around the top of the winch where the handle goes in. Lift off the the stainless top cap (the part with the manufacturer's name). Next, you remove the black outer drum, which easily lifts right off, to reveal the inside of the winch and its working parts. The drum will have two pawls (shaped like "P's") with springs in it as well as a bearing or two. This winch had two roller bearings. The pawl on the left is missing its spring. Roller bearings just visible inside. 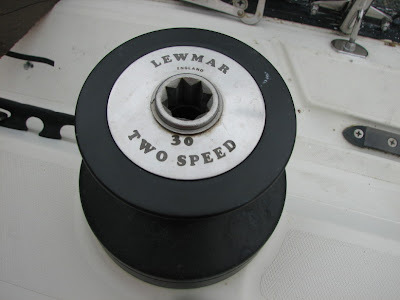 The inside of the Lewmar 30 Two Speed Winch after the drum was removed. 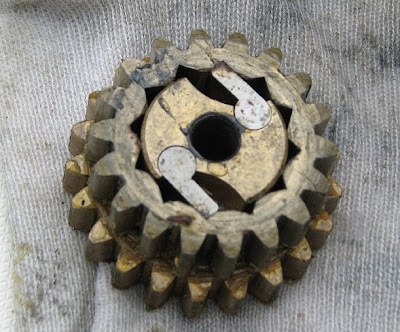 Ratchet Gears with spindle removed. Here you can clearly see two pawls, which only come in only a couple of sizes (small or large) and are interchangeable with the pawls on the inside of the drum, so there is no need to worry about getting them mixed up. Just take care when removing them not to let the little springs go flying! The gears separate and the top one fits into a little groove on the bottom one. It is possible to put them back together upside down, but not likely if you actually look at it closely. Now you are left with the center stem and spindle which lifts out after removing a small plastic crescent-shaped part. I am not sure what the correct term for this is, but again a fingernail or a small screwdriver will do to pry it loose from either end. 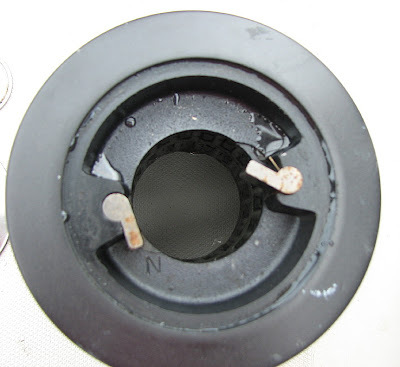 This is the only plastic part, and care should be taken not to clean it with a solvent that could damage it. The white plastic part is right in the middle. Now comes the grubby part of cleaning all the parts with diesel or kerosene and a toothbrush and/or wire brush. Wear appropriate gloves (not latex which will bag out something awful), and be sure to dry the parts well before lubricating lightly with winch grease. 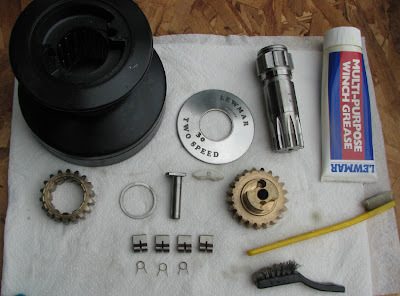 Do not grease the pawls or gear teeth as it could cause them to stick, but do apply a very light coating to all the smooth surfaces that will make contact. Here are the parts after a cleaning. Note the one pawl spring is missing, which we replaced. Also I forgot to put the roller bearings in this picture. Oopsy. Click on the image to see it larger. When reassembling, never force anything. The parts should go together easily. If they don't, you probably have them put together wrong. So that is what I have been learning. Need your winches cleaned? Call the Wicked Winch of the West, and I'll fix you up. If you want to do it yourself, kits are available at most marine supply stores, and Amazon has them, which you can purchase by clicking on the ads above. Thanks! Funny side note: The captcha for this comment is NOISA!!! Goes along with Steve's word for the doggy energy in the home. Ah, life!!!! How it likes to poke fun.